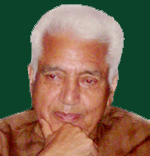 SHEHJAR - Web Magazine for Kashmir :: God: Is he responsible for our woes? ho must not have been bothered by the question whether there is a God talked of by all religions? No thinking mind would escape this pertinent query. If the much talked about Supreme Power called God were to be found everywhere, why is it that we cannot either see Him or feel Him? The answer eludes all of us till some wise people make us understand the logic behind the phenomenon, known as God whose form is not an object of vision. Are we able to see the air that we breathe? No. The reason being, that our eyes do not constitute the proper equipment to detect the presence of air. Again, while sitting in our homes, we listen to Radio and watch Television and thus witness all that may be happening in the White House or in a Basketball Arena at a particular time. We are able to see and hear what is being broadcast on a particular frequency by simply setting our radio or TV to the proper channel. Our eyes and ears by themselves could not do all this, because they did not constitute the adequate equipment for the purpose. Similarly, meditation is the process by which we can tune our minds and our very being to that frequency which helps us feel the presence of the Universal Consciousness or God. Our third eye is just that tune, the proper equipment that allows us to see beyond the physical universe. We are, thus, born with both the hardware and the software to tap the universal code of eternal joy and peace. God is not the privilege of any particular religion, community, or individual; neither is He limited to any specific installation, be it a temple, mosque, church, or any other holy place; nor is He hidden in skies, mountains, or oceans. In fact, God is omnipresent; He is in the smallest of particles, even if it is as yet unknown to science. By definition, God is infinite. Since God is the basis of all names and forms, He can be perceived or sought in any name or form dear to us. In the ultimate analysis, God is nothing but our own pure and infinite Self that illumines our intellect and the whole universe, by knowing which nothing remains to be known or defined. Science attempts to define the nature of reality, which presents itself in variety of names and forms. There are any number of realities-physical, mental and psychological realities; linguistic and mathematical realities. With the advent of computers and Internet, we now have a digital reality. But science is yet to define physical reality conclusively... hence the quest continues. If there are so many realities, what then is Absolute Reality? Spiritual science is concerned with the understanding of this absolute reality which the Vedas call Brahman. The central focus in all the six systems of Indian Philosophy, namely Sankhya, Yoga, Nyaya, Vaisheshika, Purva Mimamsa, and Uttar Mimamsa or Vedanta, is to answer this question and present the nature of man, universe and God. Brahman is defined as one that presents itself as absolute truth  one without second; eternal, omniscient and self-illuminating, as absolute bliss or joy. Absolute Reality is described as Sat-Chit-Anand or pure Truth-Intelligence-Bliss. All religions expound on this very definition of God in different ways and there is no essential contradiction in their expositions, except Buddhism, which does not speak of God at all . Vivekananda began to see God in everything-living or non-living, when his guru, Ramakrishna Paramhansa touched his chest to indicate the divinity within.. Ramakrishna believed that it was meaningless to debate over whether God had form or was formless. "Can a man really fathom God's true nature?'' he asked. ''How-ever high a bird soars there are regions higher still. God has form; He is formless, too. He is beyond form and formlessness. He who is called Krishna is also Shiva and the Primal Shakti, and He, again, is called Jesus and Allah. All people are seeking the same Truth; the disagreement is due to differences in climate, temperament, and names." Is God responsible for our woes? After every untoward happening, be it 9/11 or 26/11 or the dreadful tsunami that claimed millions of lives and made many more suffer, the devout very conveniently blame God for everything. For, if God was there, they argue, why should it all have happened? 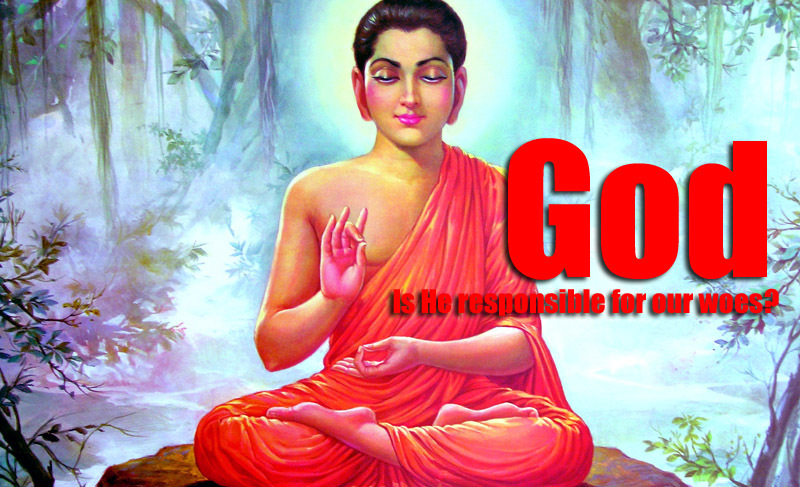 In other words, it is said that either God is not there, or if He does exist, He is responsible for all our miseries. This tendency to curse bad luck for failure, for sorrows accruing from the death of loved ones and so on is latent in every human being. If only we could remember that in the midst of inexorable natural laws, we humans do not possess the ingenuity of fighting nature, or combat natural disasters like cyclones, typhoons and the like. There is nothing like a capricious God who punishes us for some willful wrong done by us or wreaks vengeance for showing our arrogance. Indian thought has found a rational explanation for our sufferings. It is said that our actions in this or past lives determine our fate, which clearly stipulates that our sufferings, our sorrows are but the result of our own doings. We believe that the universe is governed by a moral law, which, when violated, results in our misfortunes or our bounty. There always comes a time in our lives when we become victims of bad luck, bereavement, sickness etc. Our pain and sorrow, in fact, lead us to understanding of the realities of life. Pain is the price we pay for being alive. It is pain that makes us sensitive, attentive and compassionate toward fellow beings. Not luxury, but love, not wealth but wisdom, not gold but goodness is enduring and lasting. We must, therefore, learn to love, to be wise and to be good, and do good. A very well written and inspiring article. Thank you for this illuminating article. I read it with interest. I wish that there was a quantifiable system in this world that would measure the intrinsic moral wealth and achievements on that score as there is for material wealth.